MENSWEAR SHOP — Image Consultant & Fashion Stylist for Men in India-I am Mr. Assisting and guiding my clients for styling is easy, what blurs them is what to shop after the consultation is done. So to ease those dilemmas, I decided to create a shop right here on "I am Mr." It is noting that I sell or endorse but special recommendations about the products I love and brands I believe in. Here I am curating a catalog specially short-listed for you readers and clients. Currently, focusing on brands available online and precisely in India, we will gradually widen the horizon, getting you the best-ones from across the globe. So have a look, tweet me a comment or tag me in your Instagram photos, letting me know what more should be added. TOPS: Here, I have selected some essential formal shirts along with some casual and trendy ones. As per your style and profession, you can select the best one's. 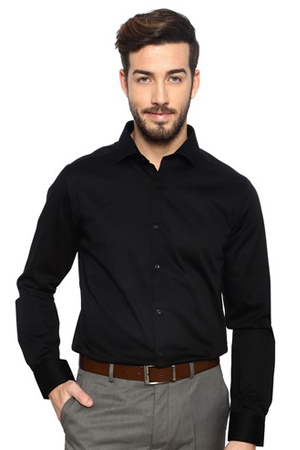 A black slim-fit cotton shirt is a must-have in every wardrobe.Best for work, parties and lot more. 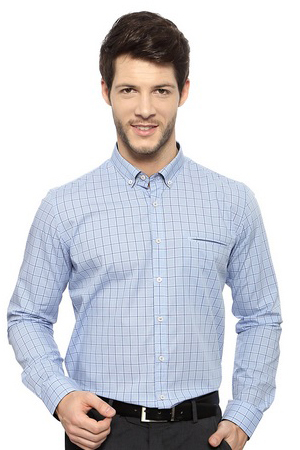 Wearing a checkered shirt at work is not only stylish but also a way of being out of those stereotype attires. A classic crisp white shirt is every gentleman's armor. With french-cuffs & cuff-link, its just too dapper. A nice blue cotton shirt with a spread collar is an essential addition to your wardrobe for those beige trousers. A casual not necessarily has to shout. 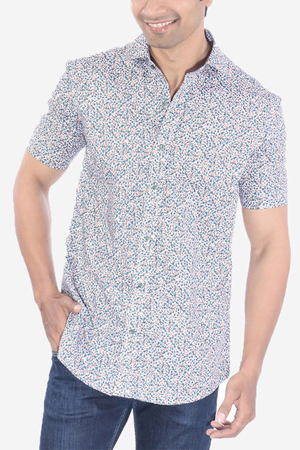 This contrasting sleeves cotton shirt will speak for itself. Denims are every man's greed and what better way to have a faded denim shirt to show some style. Ease your business-meetings with your attire. This vintage shirt worn with khakhis still helps you snap the deal. If whites and grey bored you the whole week, add some color to friday dressing with this yellow shirt. For some, prints and colors speaks about their life and what best than this doodled t-shirt to showcase that. Denim and splash. This shirt style is for those who take their style to the edge. Risk-takers armor. A classic navy roll-up short sleeves shirt for those laid-back men who take life with an ease. 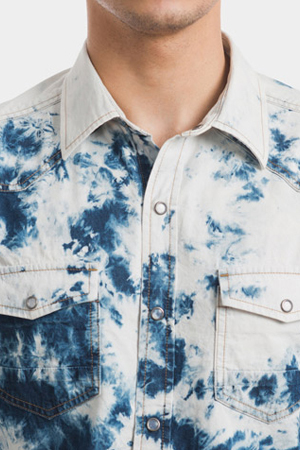 One can never go wrong by teaming up this printed shirt on an indigo denim. 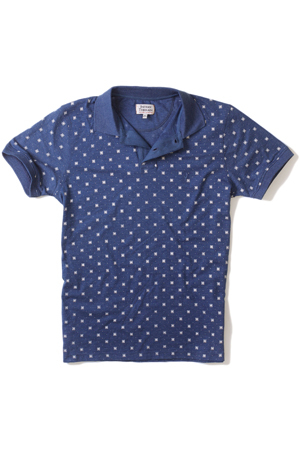 Wear this printed polo t-shirt with an olive chinos on a weekend brunch or at the bar with friends. Teamed up with a straight-cut indigo denim, this polo t-shirt is best way of welcoming a weekend. Some men are adventurous and to style their wardrobe, this Henley t-shirt is a must-have. Wear this Henley just like that or layer it with a leather jacket. It how riders roll. Bottoms: Being hot as hell in summers this year, I have just added some shorts that I found cool and classy. One can wear these shorts at a BBQ party, Pool party or just at a brunch with family and friends. Later, I shall surely add some denims and chinos and recommend some good tailors in the market for your formal trousers. Printed shorts and a solid color polo t-shirts can never go wrong, not when you know your style. Wear this hula girl woven shorts at the beach or at the pool party, wear with a pair of canvas sneakers. Navy printed shorts and white polo neck t-shirt is the right way to say you prefer style with class. Lazy Weekend? This patch worked shorts would help you shout that in a better way. Footwear: This is something that I wanted to add and guide my readers since a long time. A wardrobe without a good-fit footwear is just too mundane. A lot of men around walk around the streets with a good attire and a sloppy shoes. It is important to understand that after an age, a man's wardrobe needs typically 3 types of footwear: one for the business and work, one for those casual friday at bars and one for your weekend activities. So below are few of my recommendations as per use. This formal Black Derby shoes will make sure your Monday meetings and suits are all in-sync. Navy suit and Brown Wingtip Brogues is not just a combination but a mark of style and good-taste. Grey suits, navy suits or olive ones, this brown lace-ups is all you need to team up with. When lace-ups is just not your thing, this Black leather loafers is all you need to nail the meetings. This Brown Suede leather shoes are not only versatile but a must have if you are a denim lover. This Suede moccasins will make your weekend stylish. Wear it with shorts or chinos, at a beach or a bar. This blue lace-ups is precisely for those dapper looking men who are beyond blacks and browns. The thing about this loafers is that they are designed for all. Also for the one's who want to keep it simple. This uber Black Double Monks straps shoes are for those who want their Business meeting stylish. Extremely comfortable and colorful, this Espadrilles are for those men who experiment with their attire. Brown casual Boat shoes, for Friday casuals or a deck-party. Looks best when worn on shorts, sockless. Bike riders, mountaineers and forest lovers. This Chukka shoes are for those man who love it rough. Accessories: We men have limitations and inhibitions on several decisions of ours. A lot of men fear wearing accessories whereas there are few who flaunt is flawlessly. In this segment I want to give you a quick-look into some minimal accessories to reconsider accessorizing and flaunt it in a better way – for work, for fun or just because world needs more sharp men. Add this purple color pocket square to your black or navy suit outfits. The lapel is a cherry on cake. This tropical print pocket square is for your summer suit. Best for a Khaki or an olive green cotton suits. A bit loud in color but low on print, this orange pocket square is is best for any monochrome outfits. This Pine print silk pocket square will make your navy or a grey suit jut out in the crowd of mediocre. A classic black bow-tie with adjustable band is a must have for that Tuxedo in your wardrobe. This knitted maroon bow-tie is a versatile accessory for the suits as well as the formal shirts. This dual color strip bow-tie is a street-style accessory for those dapper looking gentlemen. Polka dots bow-tie, when you are just too bored with your usual neck-ties, add this to your attire. 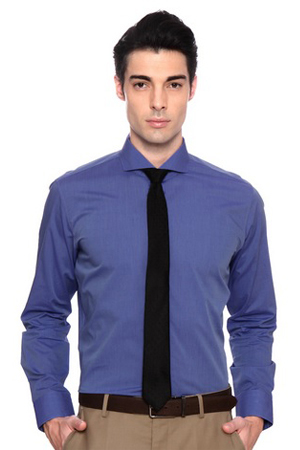 This purple and blue strip tie goes well with baby pink shirt, navy suits or even a white shirt. This grey and pink tie looks ultra stylish when worn with a charcoal grey suit. This navy tie is perfect for that important business meeting. Wear with Beige suit or Navy, your call. This blue and green knitted tie is for the one's who prefer style with an edge. Looks smart on denim shirts too. This bullet necklace will add style to your beach-wear outfits. Looks best when worn with open button shirt. As they say, it is all about details. Add this finely crafted cuff-links on the french cuffs. A tie bar that speaks about your taste, style and eye for detail. Wear it with a classy black silk tie. Rustic but finely crafted, this tie bar adds value to your outfits. It shows that you care for what you are. For those dapper looking, 90's fan, this suspenders are a must-have. With suits or denims, you take a call. Colorful yet subtle, this stylish Rio-style bracelet with a Key hook will add glam to those music festivals. For the one's who like keeping it simple, this dual cord bracelet With Burnishe Gold is must-have. For those who take Gotham and Batman a bit too seriously, this is their must-have wardrobe accessory.